We are each born with a brain, but no one supplies a user manual to help you understand how the brain works. One of the first things we have to learn is what makes up the brain. The two images above provide two views of the brain. Each image is showing us the cerebrum. The four lobes are part of the cerebrum and they four lobes are called the cerebral cortex. They help us with higher mental functions, like thought, reason, emotion and memory AND it also controls and integrates motor and sensory functions. In each image you can see the parietal lobe, the occipital lobe and the frontal lobe. The one on the left also shows the temporal lobe. The brain on the rights shows that it is split into two hemispheres, the right and the left. Below you will find information on what each lobe does. - Perception and recognition of smell, taste and sound and the formation and storage of memories. So now that we know some of the parts of the brain we need to find out how the brain works. When we talk about how it works we have to include the nervous system and the spinal cord. If we think of our brain as the command center, then you can consider the nervous system as a communication and decision making center. The nervous system has two parts, the central nervous system, which is the brain and spinal cord, and the peripheral nervous system, which is your nerves. Together these two systems control much of what you do each day, such as the ability to speak, walk, blink, recall, memorize and much more. Your nerves may start in the brain but they are found all over your body. Some nerves gather information about what is around you, your environment, and they send this information back to the brain, with the spinal cord being the main road. The brain quickly responds to this information and sends a message back using motor neurons. This image shows us what the neurons in the brain look like. Remember, neurons are actually a nerve cell. Each neuron has an axon, which helps to transmit messages that are going out of the brain to other cells, and dendrites, which look like a branch in the image and receives messages from other cells. They also have a cell body which is called a soma. There are over one hundred billion, that would be 100,000,000,000 neurons in your brain! 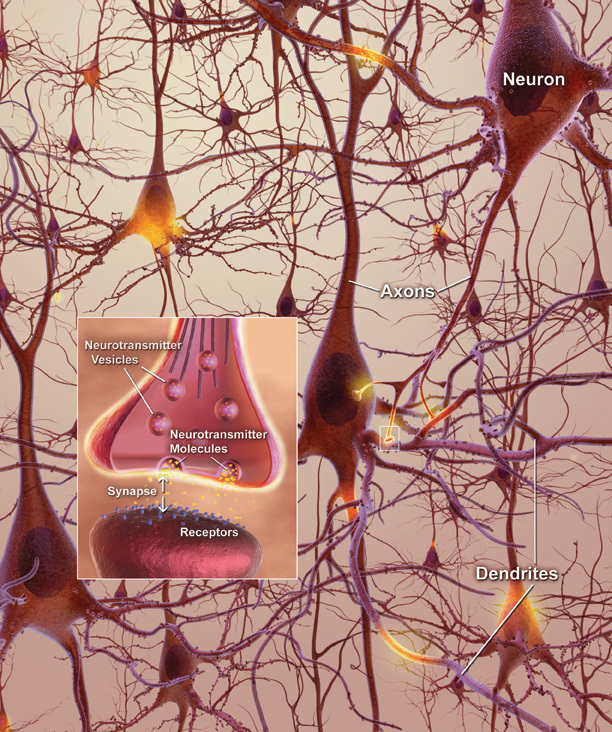 The neurons use electro-chemical signals to transfer the information to and from the brain. For communication to happen between the cells there is a small gap between the axon (which is sending the message from the brain) and the dendrite (which is receiving the message. The gap is called a synapse. In fact, the one neuron can communicate with up to 10,000 other neurons! There are five videos below which explain these concepts with visual images. Some include voice, but not all. An animated tour around the brain. This video uses images and text to show you how a neural pathways become established, comparing the growth of a trail which becomes a path, and then a road to what takes in the brain as you learn new information. Another way to look at how neuron pathways grow. This is a bit longer than the other videos. It compares your brain with the Internet, and you may be surprised by what you learn. Quoting from the website: "Enter the fascinating realm of how your brain works in this short, simple and easy to understand video. Be amazed at how much unrealized potential you have. The reality is that no one is any smarter and clever than anyone else, the difference lies in understanding how to unlock your brains power and potential. Life can be a level playing field when you learn to tap into your brains amazing potential." Enchanted Learning is a great website (for students and teachers) with a wide range of topics for students K-12. This 9 minute video provides an excellent overview of explaining how the "brain cells connet to form neural pathways that govern all our thoughts, actions and behaviors." This video presents neurons and neural pathways using the Internet as a comparison. This video discusses synapes and neural pathways but uses a different activity to illustrate the process. This video is silent. It uses images and text to convey the concept of how neural pathways are built, starting with an individual being seen running on a trail. This is an animated tour of the brain. Learn more about the nervous system at this website, designed for students and teachers. This interactive website allows students to learn about brain anatomy, unhealthy brains and you can stimulate the brain to see what happens.